Here are two examples of 4 from a side overload firezone pressures the Baltimore Ravens dialed up this season. Baltimore is in a 2-3-6 Dime personnel grouping. 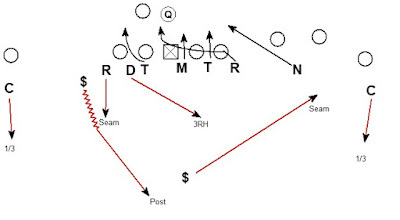 The DE's are OLB bodies diagrammed here as Rush Backers (R). 2. The Rush backers are both potential droppers. The potential the Rush backers could drop helps protect the trips side. The #3 receiver is not uncovered. The Rush is possibly the 3 dropper to the trips side. 3. The Safety bluffing weak signals 4 rushers weak when the pressure is actually 4 from the strong side. The safety alignment also further signals the Nickel is not in the pressure. The protection is in a tough spot. The structure is 3&3. The OT OG C working strong and the OT OG RB working weak. Any 4 from a side overloads the protection and requires a hot throw. 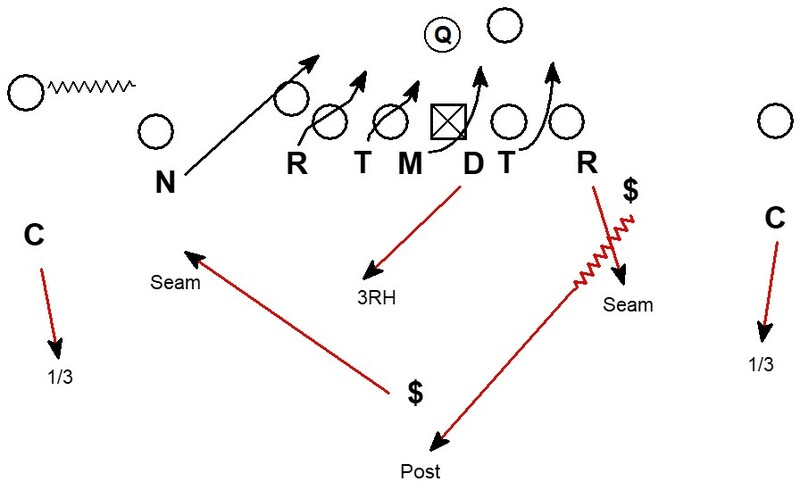 The Center cannot let the Mike cross without traveling back (cannot let the Mike be the 4th rusher weak). That leaves a 3 on 2 vs. the pressure side OG and OT. 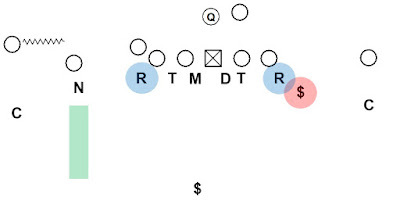 The uncapped Nickel prevents the strong side hot concept from entering the QB's mind set. The pre-snap presentation says the weak side might have 4 rushers. When the weak side Safety runs out to the post the the 4 weak hot threat is gone (QB thinks there will be time & protection) only to have a strong hot throw situation post-snap. Everything happens so quickly before the snap it is difficult for the offense to make any protection adjustments. 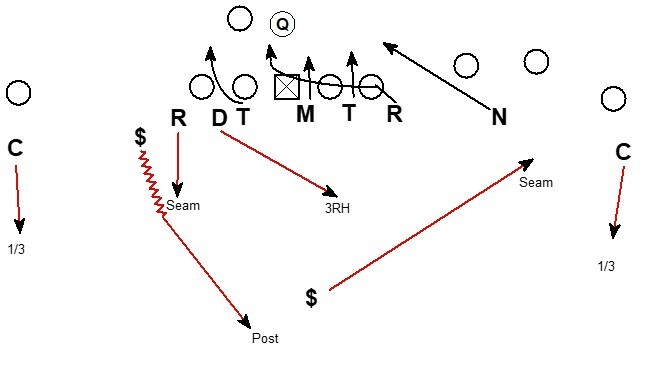 The Ravens used a similar concept later in the season. 3 under 3 deep firezone coverage again with the weak side safety presenting pressure weak and rolling the coverage late. The effect is another 4 strong rush. The look on film is the Chiefs may have adjusted the protection pre-snap to account for the pressure threat weak. The result is again a 3&3 protection. A possible protection check makes sense to put the OT OG C working weak to block the pressure threat. The protection sends the RB strong with the OG and OT. The issue is the protection ends up with 3 blockers on the weak DT (3 on 1 is a defensive win). 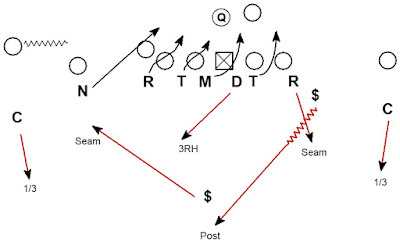 The RB is forced to pick up the Mike in the A gap. The penetration of the Mike makes the OG's job to block the looping Rush almost impossible. Quality pressure designs from the Raven defense to overload the protection.